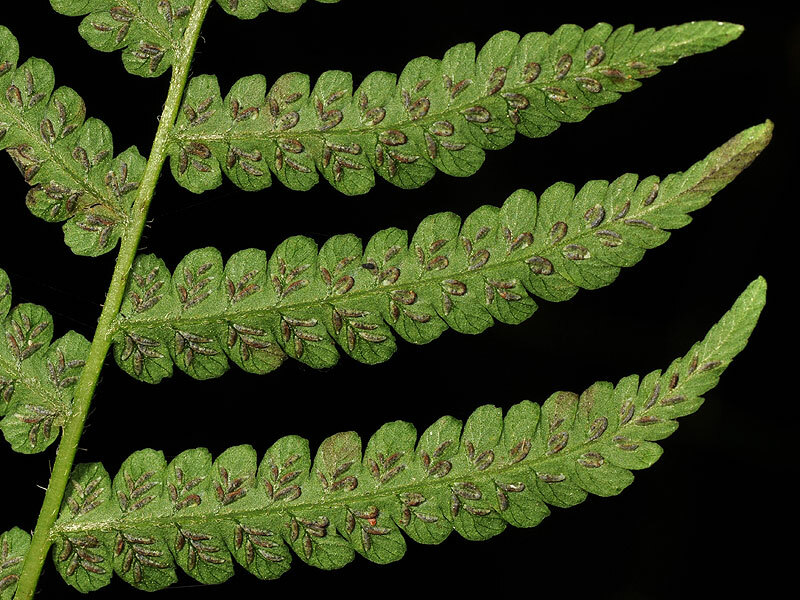 Deparia acrostichoides (Athyrium achrostichoides; silvery glade fern). en.wikipedia.org (Accessed 10/2017). 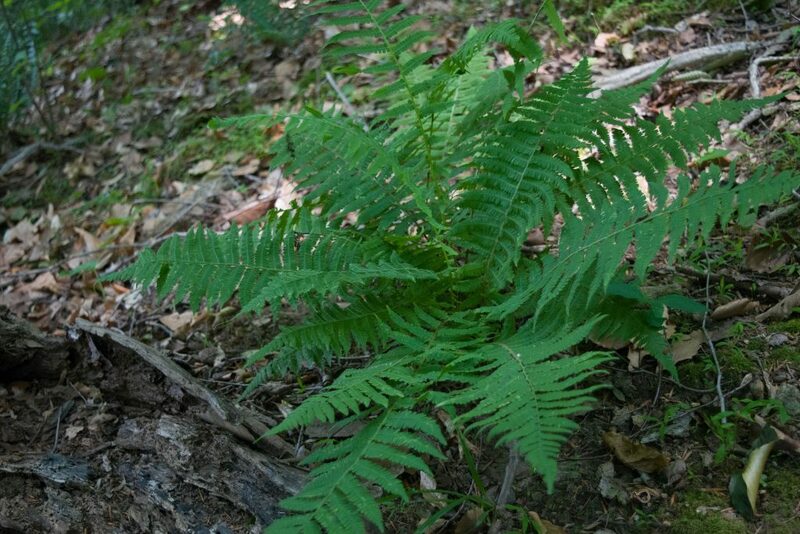 Deparia acrostichoides is a fern from a short, creeping rhizome. 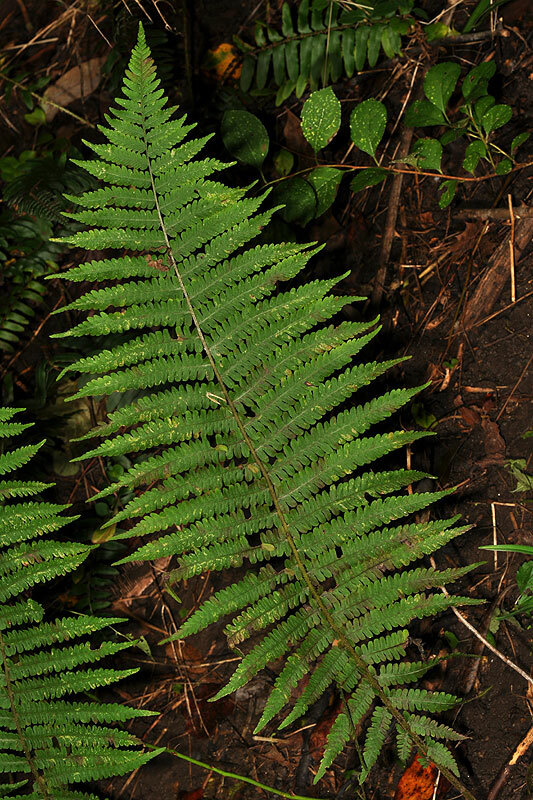 Deparia acrostichoides (silvery glade fern).frond. copyright David G. Smith. Delaware Wildflowers. delawarewildflowers.org (Accessed 10/2017). Leaves 35-110 cm; blade longer than stalk, 13-22 cm wide, once pinnate and pinnately lobed, tip sharply long-pointed, pinnately divided, basal leaflets reduced and pointing downward, midrib (rachis) hairy, slightly scaly, hairy, leaflets 15-20 per side, stalkless, tips long-pointed, deeply, regularly lobed, lobes to 1.3 cm long, 0.6 cm wide, oblong, round-tipped with margins entire to barely toothed. Spore cases elongate, to 0.2 cm, 3-7 pairs per side, along pinnate veins of leaflet lobes, silvery with yellowish hairs, becoming pale brown (Cobb 1963). Habitat: Moist woods in rich soil pH 4.5-7, tolerant of shade, intolerant of fire, salt, anaerobic soil, drought (USDA, NRCS 2006).